Super Foods are creating the latest buzz in eating theory. The antioxidant nutrients found in this category of comestibles are apparently the key to offsetting the damage that time and lifestyle inflict on our bodies and minds. In humans, the entire aging process depends on oxidation, damaging free radicals wearing down our DNA. But research reveals that we can slow down this aging in most of the systems of our body, simply by eating antioxidant nutrients. So super are super foods, that studies by the US government’s anti-aging research department show that the amount of antioxidants we maintain in our bodies is directly proportional to how long we’ll live. So how to boost our vital intake? Five daily portions of fruit and vegetables is a good start, though the 8 – 10 recommended by the World Health Organisation is even better. Also, pick your produce with care, for the most powerful nutritional punch. Antioxidant level in food is measured by its oxygen radical absorbency capacity (ORAC score): the oldest-living people consume at least 6,000 ORACs a day, say nutritionists. On the super foods list are things like apples, asparagus, blueberries, beans (kidney) and plums. Surprising supers are mustard and dried oregano; tempting ones are dark chocolate and red wine. Consume one portion of any three of these a day and you’ll look 10 years younger. 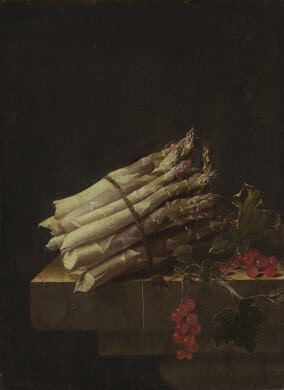 The Dutch still life painter Adrian Coorte (active c. 1683 – 1707) must have been ahead of his time in terms of nutrition: he made his plain-old asparagus look super (natural, beautiful and delicious) in his still-life Asparagus and Red Currants (1696). Despite research, little is known about Coorte: his dates are uncertain, though his signed, dated paintings (100 of them) indicate his period of activity. We think he worked in Middelburg, the capital of Zeeland, a province in the south of the Netherlands. It seems there was another Adrian Coorte there (possibly his father), and the younger Coorte’s works were collected by people in the area. This little masterpiece (it measures 34cm x 25cm) is understated, yet original. Coorte does what he usually does and sets a couple of ordinary objects on a table top (wood in this case, occasionally it’s stone). He creates his composition from there. The elements are sparse but somehow amount to a feeling of grandeur and dignity in this arrangement. 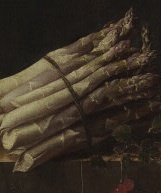 There’s a subtle balance between the diagonal line of the asparagus and that of the largest twig on the berries. As is typical of 17th century Dutch still-life art, Coorte works in subdued tonal harmonies, his palette comprising soft purples, reds, greens, whites and browns. He also concentrates on texture (again typical of his time and genre), rendering the sheen of the berries as distinct from the woody cut-off stems of the spears. It was not until the 1950s that Coorte was rediscovered by the Dutch art historian L. J. Bol. It’s hard to believe that the artist was lost from view for quite so long: his work in the NGA is shot-through with an arresting brand of beauty. Coorte is gifted at deceiving the eye, making his objects look uncannily real. He’s also able to tap a deeper, more disturbing vein, hinting at the transience of life by focussing on these seasonal, ultimately perishable wonders. How fitting to be talking of the transience of life in the presence of a big bundle of asparagus spears. Coorte seems convinced of some super quality and that’s good enough for me: so pass us some more and let’s tuck in!